First of all thanks for your SEO guidelines. All these tips are seeming very valuable for me. I'm looking forward to further reading. Very nice examples are given and in great detail revealed. Thank you! Just started reading this today. At a quick glance, it looks quite good and goes fairly in-depth on some important subjects. Can you tell me if everythign is relivant even with the Panda and other updatesw Google has made reently? Have yu updated the book to take these into account? First of all thanks for your guide. All tips are seeming very valuable. I look forward to further reading. I wish to ask one thing that, what is relevance between search result and google page rank. If a websites page rank is higher than competitive website, then would it appear first for similar keywords search on Google? Not necessarily. PR simply determines how much authority an outgoing link would bear, but very often pages without high Google PR rank higher. It's two years old and we have grown to 145 members. Average traffic is 400 visitors every week to a local site. The site gets page one Google results for many of the main keyword terms. I guess I got lucky. Now that I have become proficient in WordPress I am learning SEO, as I am expanding the guild to neighboring areas. Now that I'm learning SEO I understand how lucky I got because the site has almost no backlinks but gets great SEO. I found your site via Brad Callen's SEO pages. His software does not work on Macs, and I'm sure as hell not going to buy a WIndows machine. 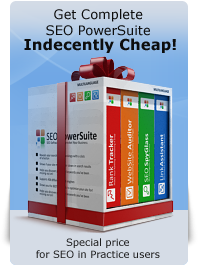 SEO Power Suite works on the Mac, so I am investigating it. I just started reading your book. Thanks! I'm impressed. I'm going to read/study the book first before buying any software. I like how you do business. This a great read even for seasoned 'seo experts'. I now recommend this to people who don't always have money to invest in SEO. I started last January writing articles and finally find my way to blogging. So, I've done my homework studying my way to adsense, blogs, ranks, traffic, SEO, and other facets of online endeavors. Actually, I don't know some other areas of this job. Thank you so much for letting me in here. I am very thankful to you for this book. I am very happy to find it and sure to learn a lot from it. Yes indeed, after browsing your book I can say you did indeed cover all the pertinent points in a fashion both for beginners and experienced SEO adepts!